If you follow me on Instagram or even just had a short conversation with me, you probably know I have two dogs. 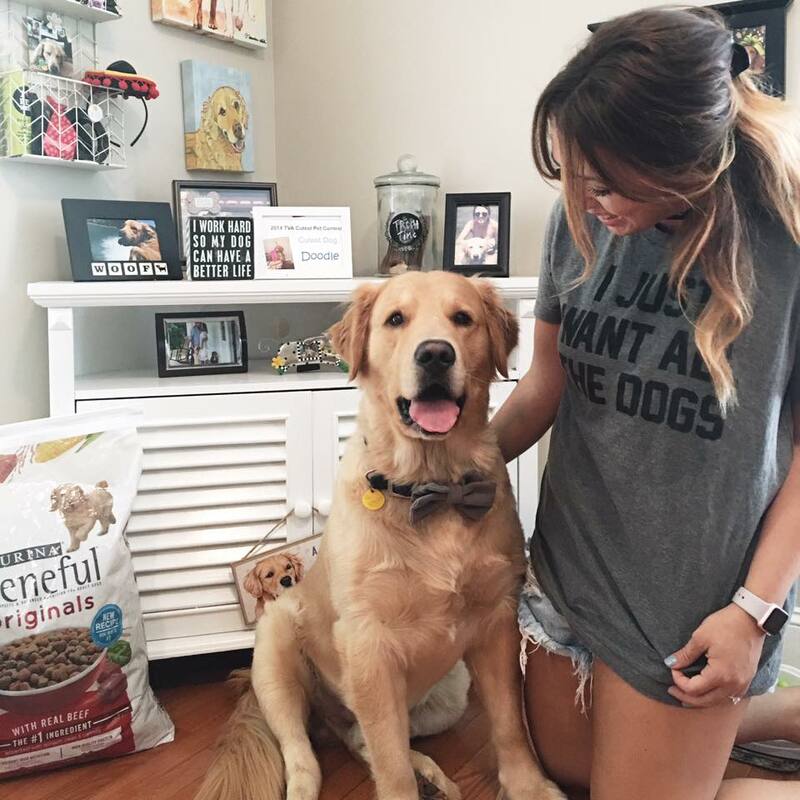 Extremely loved, Golden cuties that are treated special every. single. day. The problem with this is, your house becomes an overflow of dogs! Not only do they take over the bed, the couch, and everything in between but toys and treats were strung everywhere. 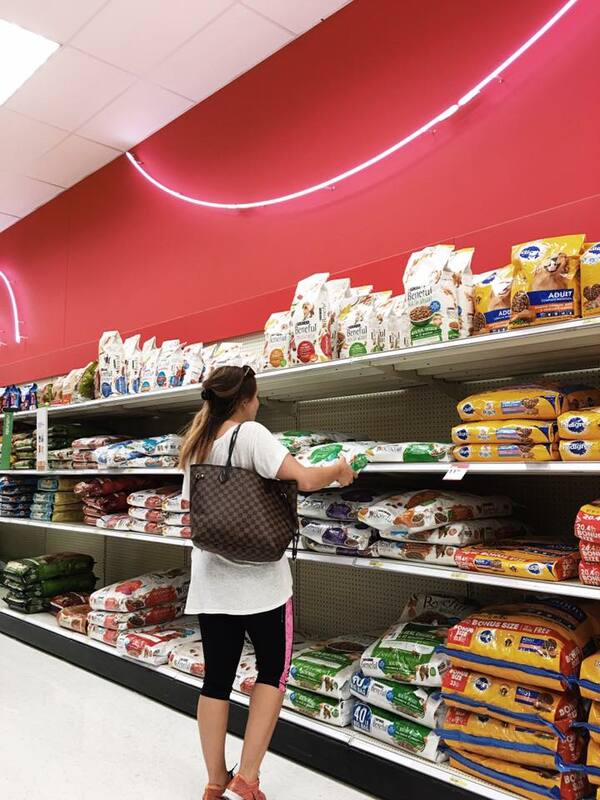 Anytime I head to Target to pick up Purina Beneful Originals dog food, I always end up with about 5 million extra things in my cart. Most of the items lately have been dog toys and treats. After an overflowing toy basket, I decided to convert our old TV stand into Pup Central. Treating the pups starts with their food. I always watch everything Babe and I put into our mouths, and I make no exception for Dallas and Doodle. I would feel so guilty if I was eating great food but skimping on theirs. 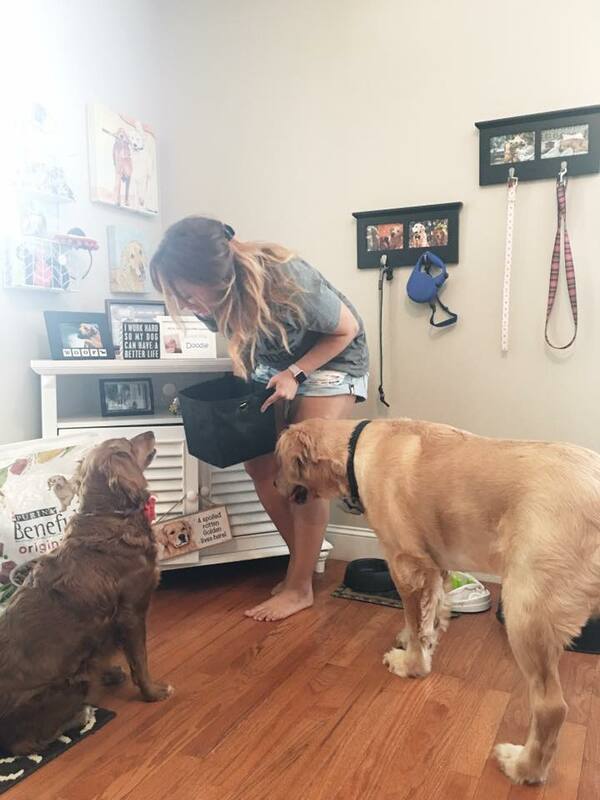 Meal time is their favorite time of day and knowing I’m feeding them Purina Beneful Originals reformulated dog food with meat as the #1 ingredient and no sugar added, I feel like I’m showing them how much I truly love them. After they devour their favorite food, we love to spend some time playing with their favorite toys. Since the old TV stand has two shelves inside, we can keep the dog food containers on one shelf and Dallas’ all time favorite toy on the second.. TENNIS BALLS! On top of the chest, we like to display some of the cutest photos, which is always hard for me to choose because I love them all. We also keep a jar to hold treats + a set of hanging baskets to hold their accessories! Doodle has to have socks when it’s cold and rainy or she won’t use the bathroom. Diva! 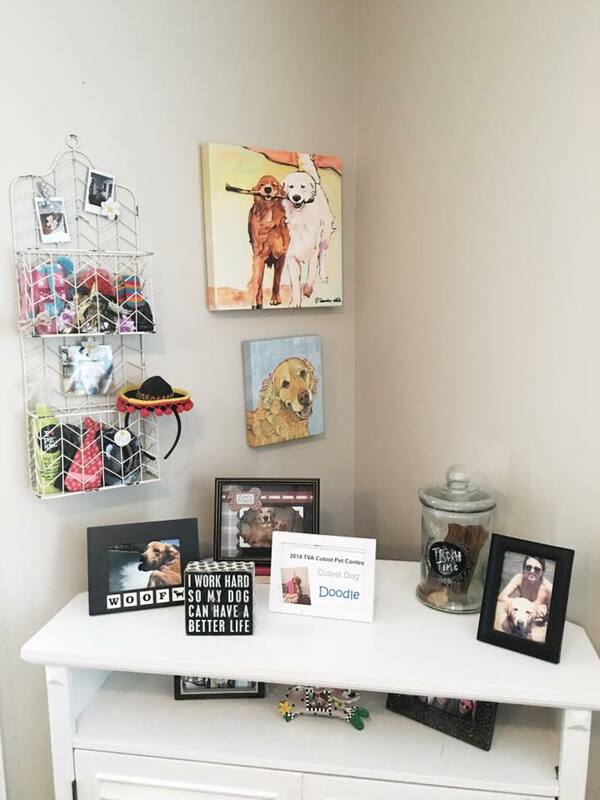 Above their food and giant water bowl, we converted a key holder into a leash holder (and more pictures of the pups!). 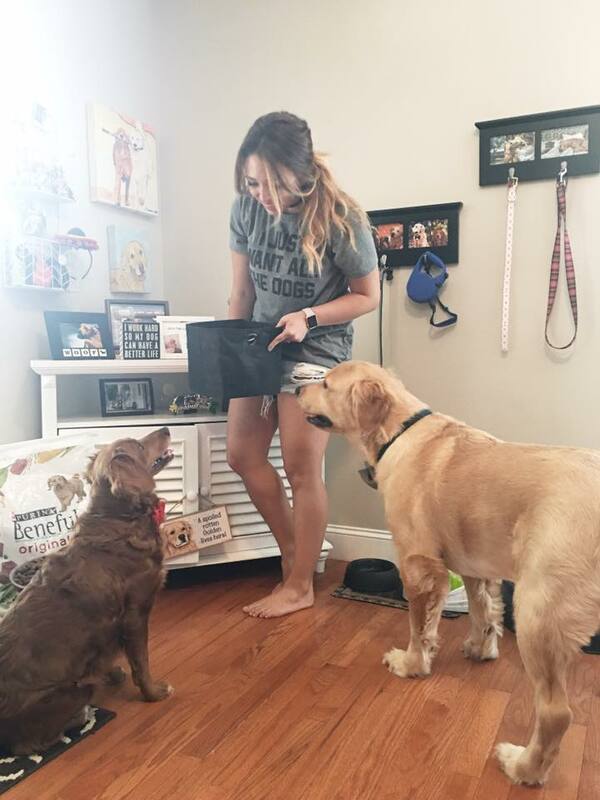 Staying organized not only keeps the house looking tidier, but it allows me to spend more time with the pups. Good food, quality time and lots of tennis balls to keep these two Goldens happy and myself sleeping sound at night. 1. Start Big! Find an old bookshelf, TV chest or piece of furniture to house all the necessities. 2. Stock it with the Best. To ensure that it is as helpful as it is adorable, make sure you start with the most important items. 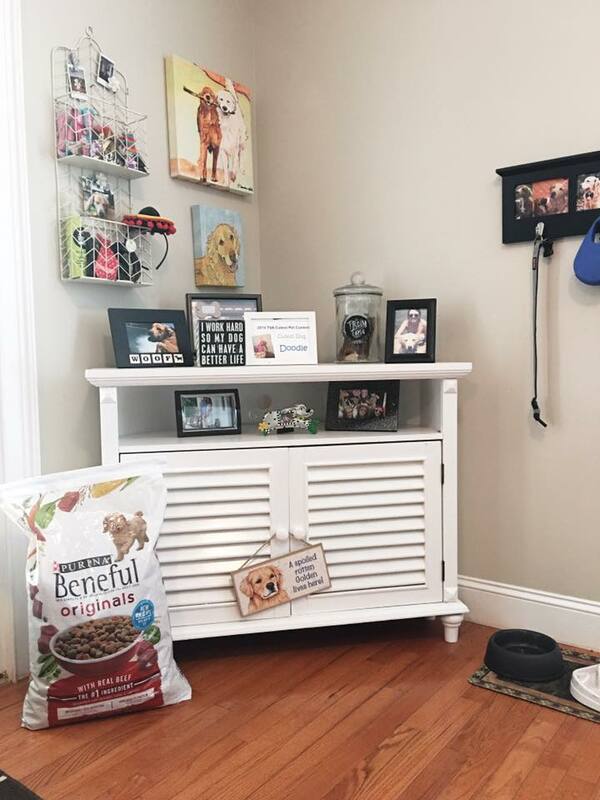 You don’t want to pack it full of tennis balls, only to find you no longer have room for your Purina Beneful Originals dog food. 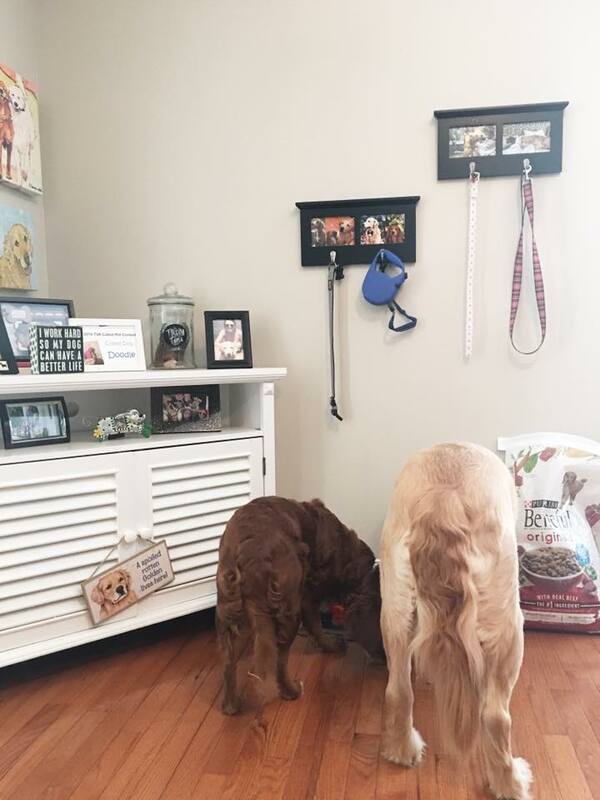 We keep our dog food in baskets that we purchased from Target and a measuring cup in the cabinet as well to ensure they receive the correct amount of food every time. 3. Find their Faves. After the most important items are in their place, fill the rest with their favorite items. We keep tennis balls, stuffed animals, frisbies and other toys on the shelves. It’s great to grab something fun as we head out the door for an adventure! 4. Decorate! This is my favorite part. 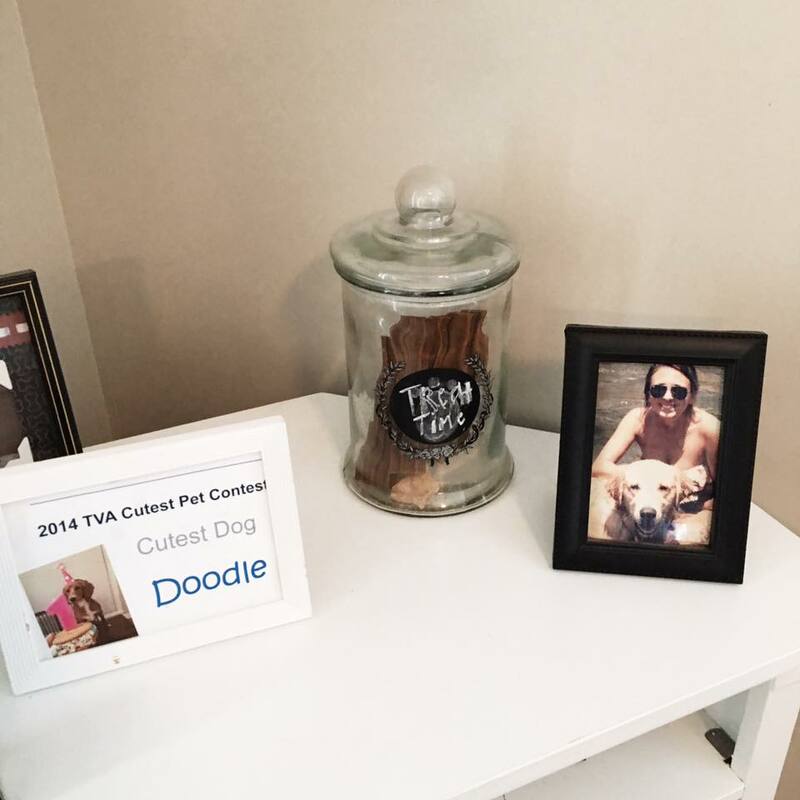 We mixed photos of both pups as well as awards they’ve won and polaroid pictures we’ve snapped over the years. We also added a few custom portraits to show how truly special they really are. 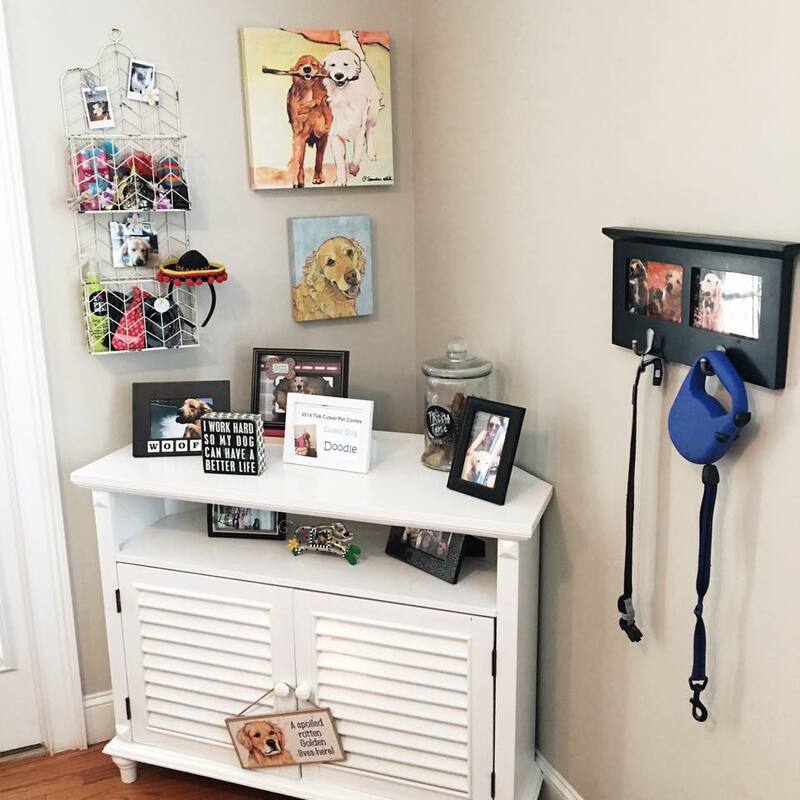 Bonus: Hang baskets for collecting small accessories such as bows, socks, scarves and sunnies or repurpose old hooks to hang their leashes in between walks! As a special gift for my readers, I’ve teamed up with Beneful to offer you a free sample of their new formula! The dogs go crazy over it and I swear I’ve never met someone as picky as Dallas (he won’t even sneak a pretzel if you don’t dip it in something first!). 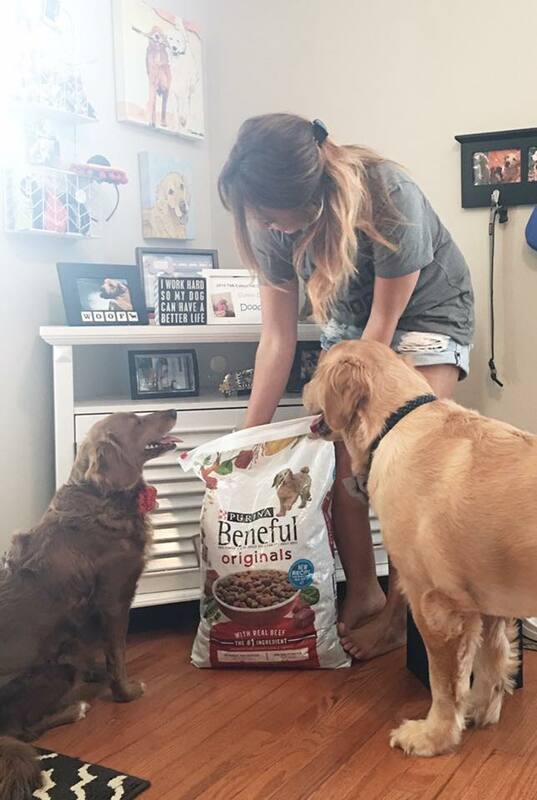 Click here for more info on how to transition to a new food without upsetting the pup pups.